This typically American combination of sweet pancakes and maple syrup combined with bacon makes a great-tasting choice for a relaxed weekend family breakfast. Waitrose British Bacon comes from Waitrose Fresh British Pork, reared under the Farm Assured Pork Scheme. After it is cured with salts, the bacon is smoked over beech wood chips to ensure a deep smoky flavour. Preheat the oven to 150°C, gas mark 2. Sift the flour and sugar into a bowl, make a well in the centre and add the eggs. Mix with a fork or electric whisk and gradually add the milk to form a smooth batter. Heat a little oil in a large frying pan. Using a tablespoon, add 4 spoonfuls of batter to the pan to make 4 pancakes and fry on each side for 1 minute or until golden. Using a palette knife, flip the pancakes over. Repeat to make 12 pancakes in total. Place the cooked pancakes on a plate and keep warm in the oven. Meanwhile, cook the bacon under a preheated grill, set on high, for 4-5 minutes, turning once, until crispy. Cut the rashers in half. Pan fry the mushrooms and cherry tomatoes in a little oil for 3-4 minutes. Stack 3 pancakes up with pieces of bacon between each layer on individual serving plates. Pour 1 tbsp maple syrup over each pancake stack. 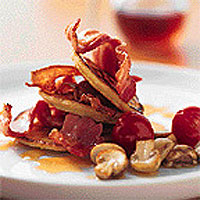 Serve the pancakes with the cooked mushrooms and cherry tomatoes. The maple syrup can be replaced with golden syrup.